It's the fastest one-legged game on the planet—now played in 47 countries around the world. 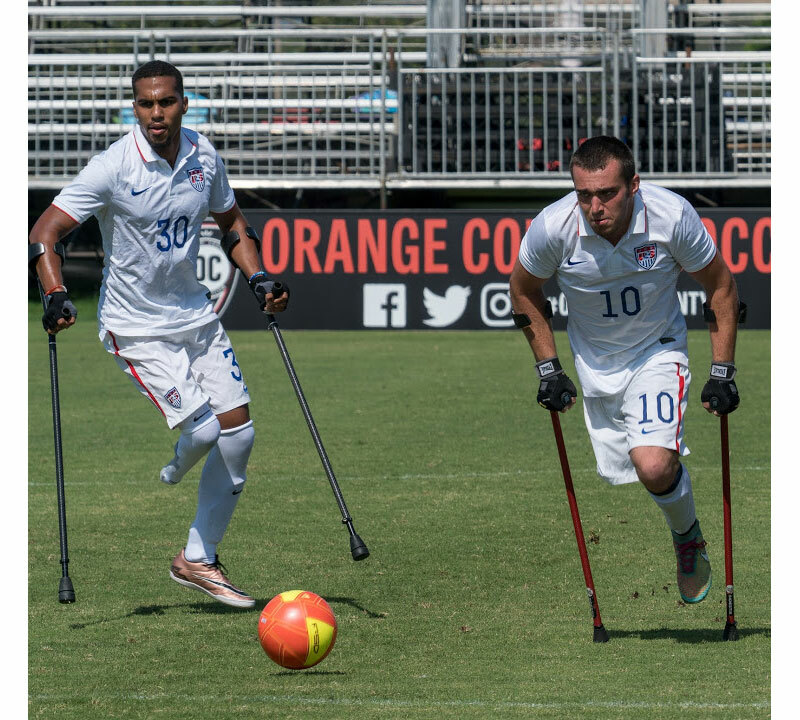 And Team USA is training to compete in the 2018 Amputee Soccer World Cup in Guadalajara, Mexico this fall. And please don't make the mistake of dismissing the game as "disability" soccer. It's fast, it's physical and it's highly competitive. So competitive that it has its own World Cup featuring the best world-class athletes in the world. So competitive that in the recent European championships in Istanbul, Turkey, interest was so high that the Gold Medal Match had to be moved to a professional soccer stadium—which was stuffed to the rafters with 41,188 fans. The game was invented in Seattle, Washington, in 1982. By accident. Yes, by accident. Amputee Don Bennett was watching his kids in a driveway basketball game, when a ball escaped. Rather than letting it roll down the driveway, Don raised up on his crutches and kicked the ball back—and had an Oprah moment. He thought "If I can do that with a basketball, I can do that with a soccer ball." He gathered some other amp friends together to play soccer in the summer as a way to stay fit for skiing season—their "real" passion. But the sport took off, spreading south to Los Angeles, and north to Canada; then to El Salvador, Uzbekistan, Russia and England. Amputee soccer is played all over the world, even in as remote a place as Nepal. "You have to be missing a body part to play," said Rick Hofmann, president of the American Amputee Soccer Association. "Field players must be "abbreviated" at or above the ankle, and must play on forearm crutches. Goal keepers may have two legs but only one arm—abbreviated at or above the wrist." Hofmann, a former collegiate player and member of the 2000 USA World Cup team, said the game stays as close to FIFA rules as possible, with only a few key rule changes based on the players' configurations. "Rather than throw-ins, we have kick-ins. It's kind of hard to throw the ball into play standing on one foot with crutches dangling from your arms…"
The pitch is a bit smaller, 60-meters long; and the goal is a bit smaller, five meters wide by 2.2 meters high. "Give the keeper a break," Hofmann laughed, "He only has one arm!" Two other modifications were added because play is so demanding on the upper body. In this game, substitutions are unlimited, and a substituted player may re-enter the game. And the offsides rule has been eliminated. "Other than that, the game is FIFA soccer," Hofmann added. And though the game is "amputee" soccer, those with limb birth issues are also welcome to play. "Inclusion" was never a question in this sport. Women were an integral part of the very first team. They were also members of USA World Cup teams beginning in 1984. 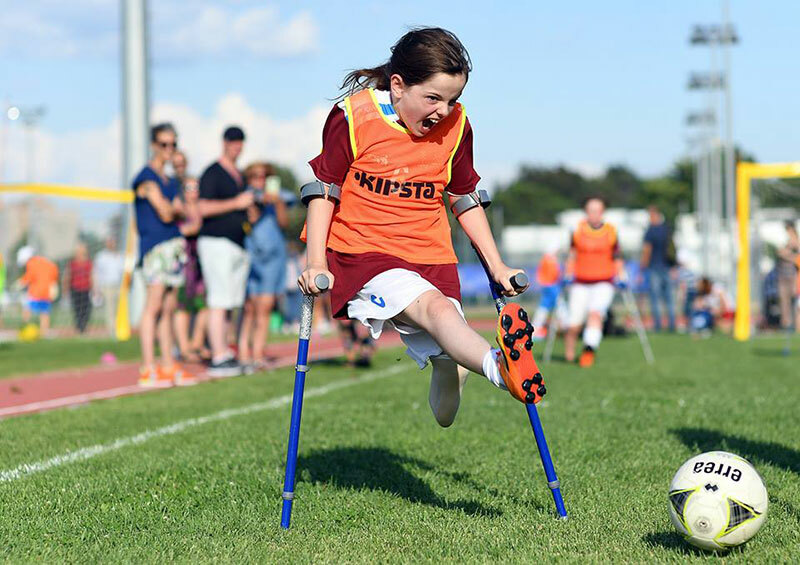 The ethic established by the United States back in 1892—before inclusion was fashionable, is now a part of the world-wide amputee soccer culture. In fact, it was a member of that very first team, Dee Horton Malcho, who single-handedly introduced amputee soccer into Africa. She'd was working as a registered nurse with amputee veterans of Sierra Leone's horrendous civil war. She wasn't having much luck getting the veterans to try—kuntil she took her leg off, got up on crutches and began kicking the ball around. They soon joined in. From Ms. Malcho's first kick the game grew to include nine African nations. Kenya, under the leadership of Ms. Charity Kamau, because the first nation ever to field an entirely female squad. American veterans are also embraced by the sport. Team USA made it a point to go to the US Military Hospital in Bethesda, Maryland, and to other VA hospitals, to teach our wounded warriors how to play. Former Sgt. Robert Ferguson, who played semi-professional soccer while stationed in Germany, is the American Association's Development Officer for the American South. Robert lost his leg to a tracked mobile rocket launching vehicle, and had a very hard time in the aftermath. After discovering amputee soccer, he simply says, "Amputee soccer saved my life." He's on the short list for the 2018 American World Cup team. "The kids need to know they can play a sport like every other kid. And they know that if they can play a sport, they can do anything. This is a great game to start with." Amputee Soccer will make its Abilities Expo Houston debut on August 3, 2018 at noon.